1. Place Mirrors Strategically: Mirrors work wonders when it comes to visually expanding a space: not only do they look sleek and modern, but their reflectiveness gives the illusion of depth. Even better, if you’re using a mirror to highlight a bathroom window – this method will bring in lots of light and make your bathroom a more tranquil space. 2. 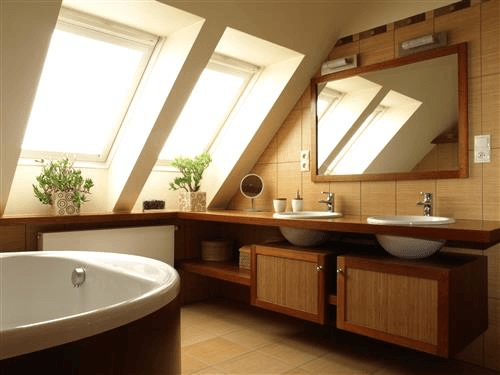 Provide Lots of Light: Natural light is always best, whether from a skylight or bathroom window, but any added illumination can help a small bathroom look airy. Try using ambient lighting combined with vanity or spot lights for ample brightness. 3. Remodel Distracting Tiling: Rows of shower tiles mean an abundance of grout to clean, and can look visually overwhelming in your design scheme. For an updated look, try replacing small tiles with larger panes, or eliminate tedious cleaning entirely by installing a low-maintenance acrylic bathtub or shower enclosure. 4. Use Shower Walls with Shelving: In a cramped bathroom, you’ll need to make the most of any available space. Limit cumbersome shower storage by looking for wall enclosures with recessed shelving, or install corner shelves. 5. Invest in Proper Storage: After tackling shower storage, do the same to clear available countertop space. Store toiletries and accessories out of sight, such as underneath sinks or in cabinets. 6. Install a Medicine Cabinet: Take efficient storage one step further with a recessed medicine cabinet to gain a few extra inches of space. Plus, these days, there are so many medicine cabinet designs to choose from, whether you’re looking for solid glass or a mirror with handsome maple trim. 7. Paint the Ceiling: Paint your entire bathroom, including the ceiling, the same color. This helps limit visual transitions by eradicating lines and seams that break up the room. This is especially helpful in older houses with unusual architecture, like dropped or angled ceilings. 8. Try a Modern Touch: Replace vanities and cabinets with “floating furniture,” which installs directly onto a wall and does not require leg support. Without cabinet legs lining the floor, your bathroom will instantly look more spacious. 9. Go Glass: Opaque or textured walls can partition the whole room, separating shower from sink or toilet. Try using transparent glass shower walls or doors instead. This will help minimize visual segmentation and make your bathroom look like one large space. 10.Make the Most of a Shower Curtain: Though glass or acrylic shower walls are ideal, it’s just not possible in some homes. If you’re looking for a shower curtain that won’t crowd the look of a small bathroom, try one in clear vinyl. This mimics the look of glass to help make the space look larger. Try these tips to make your bathroom look bigger instantly, and without undertaking costly construction. If you’re looking to improve the overall look of your small bathroom, try shower stalls from American Bath Enterprises, Inc. We offer acrylic wall enclosures which make the renovation of existing bathtub and shower walls easy and affordable. Our popular AmeriWall™ wall enclosures can also drastically cut down on maintenance, as there is no grout to cause mildew. To speak to a representative for more info, or to request custom sizes not listed on our website, give us a call at 888-228-4925.